In December 1913, the New York World newspaper published the first crossword in history. It appeared in their Sunday supplement, “Fun.” A century later, this absorbing puzzle continues to attract (and infuriate) millions of devotees every day. But the world’s most popular—and seemingly mundane—pastime has a surprising history, filled with intrigue and adventure. 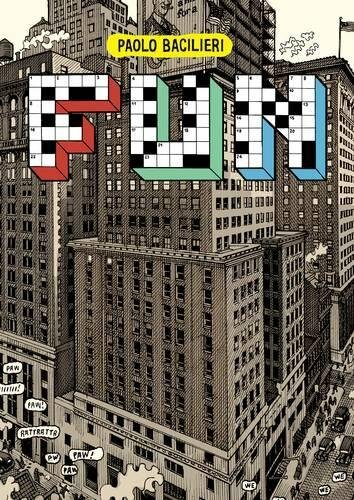 Paolo Bacilieri’s FUN transports us from turn-of-the-century New York to present-day Milan, taking in stories of ingenious puzzle makers, ardent solvers, and intellectual luminaries. Part detective story, part docudrama, and interlaced with a fiction of Bacilieri’s own imagining, FUN questions the crossword’s “harmless” status. Sure, it’s fun—but could it also be a form of resistance, of cryptic communication, of espionage?